Mounting evidence that an onboard bomb brought down the Russian jet that crashed on Egypt’s Sinai Peninsula, killing 224 people, poses a tough new dilemma for President Vladimir Putin: how to respond. If the theory of a terrorist attack is borne out, it will look like exactly what Islamic State militants have said it was: swift and deadly retaliation for Russia’s military operation in Syria. Until and unless there is powerful proof the crash of Kogalymavia/Metrojet Flight 9268 was caused by a bomb carried on board or stowed in the baggage hold, Russia will be tempted to drag its feet on acknowledging that possibility. A technical cause would be embarrassing for Putin, too, but less so than a terror attack because plane crashes caused by mechanical failure or pilot error are an all-too-familiar phenomenon since the 1991 Soviet collapse, and few Russians would blame Putin personally for the tragedy. Terrorists have brought down Russian planes before: In 2004, days before militants attacked a school in the North Caucasus town of Beslan, two women from Daghestan boarded separate domestic flights and blew them up in quick succession on a single night, killing all 89 people aboard. But the Airbus jet that broke apart high over the Sinai was outside Russia, headed from the Red Sea resort of Sharm el-Sheikh to St. Petersburg, Putin’s hometown. The death toll — all 224 people aboard — was the highest in the history of Russian and Soviet aviation. The idea that such flights are vulnerable further undermines a crucial element of the unwritten contract Putin has forged with middle-class Russians in more than 15 years in power: Fall in line politically and you will enjoy perks that were far out of reach for your parents — like beach vacations abroad. And all but the most slow-witted slaves to Kremlin propaganda might wonder about the value of Putin’s pledges to protect compatriots worldwide — a group that was the subject of a high-profile meeting in Moscow on November 5 — if they see Britain and other countries cancelling Sinai flights and Russia making no changes. The main problem with denial is that it can only work if it is plausible. As evidence of a possible bombing has mounted, both Russian and Egyptian officials have warned loudly against rushing to judgment. Putin made no mention of a possible cause when he broke two days of silence on November 2 and described the crash as an “enormous tragedy.” Putin’s spokesman, Dmitry Peskov, said on November 5 that talk of a bomb on board was “speculation,” and Prime Minister Dmitry Medvedev said it was too early to draw any conclusions about the cause. Russian officials have decades of experience with the blame game, and pointing the finger at Egypt might seem like an obvious course. In its efforts to deflect accusations of involvement in the missile strike that brought down a Malaysian jet in eastern Ukraine last year, killing 298 people, one of Moscow’s arguments is that Kyiv is ultimately to blame because it did not entirely close the airspace over the zone where Russia-backed separatists were battling government forces. But blaming Egypt would fit badly into Russia’s new power politics in the Middle East. Putin has assiduously courted the country, long a much closer partner of the United States, and even endorsed President Abdel Fattah al-Sisi before his election in 2014. 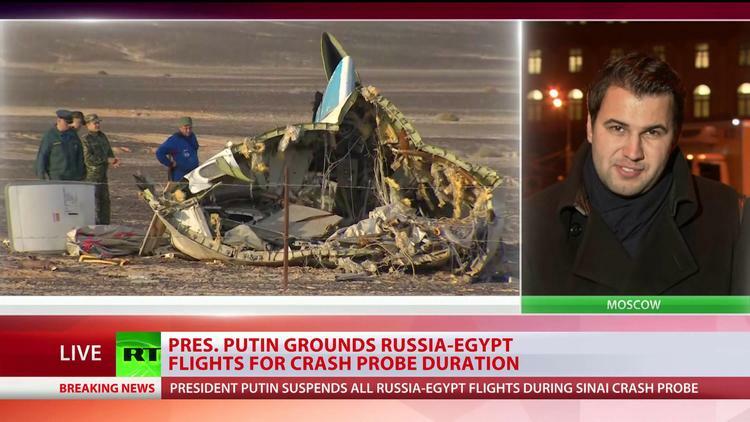 Also, Kremlin criticism of Egyptian security measures might make Russians wonder why their government never raised the issue before, as hundreds of thousands of them flew in and out of Sharm el-Sheikh and Hurghada, another Egyptian resort, for vacations in recent years. The tried-and-true approach for Putin, particularly in his third term. He has blamed the United States for street protests that shook the Kremlin in 2011-12 and accused Washington of giving direct backing to militants in Russia’s North Caucasus. It would be a stretch to lay the blame for the Sinai crash squarely on the West, but it seems likely the Kremlin will point the finger as much as it can. Jabs at the West may fit into the Russian narrative that holds that U.S. and European actions in the Middle East have facilitated the rise of the Islamic State (IS) group. Since Putin launched the campaign of air strikes in Syria on September 30, officials in Moscow have lashed out angrily at Western political and military leaders who have warned that the intervention could lead to Russian casualties or other painful consequences in short order. Faced with evidence that a bomb brought down the jet — and with alleged statements from militants saying that the victims were “crusaders” punished “in response to Russian air strikes that killed hundreds of Muslims on Syrian land” — officials in Moscow might go so far as to claim that such statements have encouraged IS to attack Russians. Already, the head of the International Relations Committee in Russia’s upper house of parliament has claimed that Britain’s decision to suspend all flights to Sharm el-Sheikh — a response to concerns that the Russian plane was bombed — was motivated by London’s opposition to Moscow’s actions in Syria. “There is geopolitical opposition to the actions of Russia in Syria,” state-run Russian news agency RIA Novosti quoted the lawmaker, Konstantin Kosachyov, as saying on November 5. Hours later, Russian Foreign Ministry spokeswoman Maria Zakharova lashed out at Britain over the move, accusing its government of failing to share intelligence about the plane crash. While such a statement will not hold water among Western officials, it could work with a domestic audience — and dovetails with Russian calls for the United States to share more information about IS fighters and other militants in Syria. Proof that IS-allied militants brought down an airliner full of Russian vacationers a month after Moscow launched air strikes in Syria would be a heavy blow for Putin. But if he is forced to accept that it was a bomb attack, he will seek to soften the impact and use the tragedy to further his agenda at home, in the Middle East, and in relations with the West. Abroad, as he did when Al-Qaeda terrorists attacked the United States on September 11, 2001, Putin might use the tragedy to bolster his case that Russia and the West face a common foe and must work together — on Moscow’s terms — to defeat it. In the Kremlin’s eyes, that means that the United States, Europe, and Gulf Arab states must drop their criticism of the Russian campaign in Syria and accept Moscow — and Syrian President Bashar al-Assad’s government — as allies in the fight against IS. But this is a double-edged sword: Depicting his country as a strong, defiant state under attack from IS raises the pressure on Putin to go after IS more aggressively in Syria rather than pursue the more modest goal of shoring up Assad and positioning Russia to maintain influence in the event of a political settlement of the civil war. That, in turn, could mean getting more deeply involved in the conflict — a costly endeavor that could hurt Putin’s popularity at home if Moscow’s biggest military operation outside the former Soviet Union since that country’s demise goes awry.